Another brief break in the stormy autumn weather this morning so I took Millie, one of our Teifi skiffs, to the mouth of Langstone Harbour and had a warming cup of coffee at the beach hut cafe. 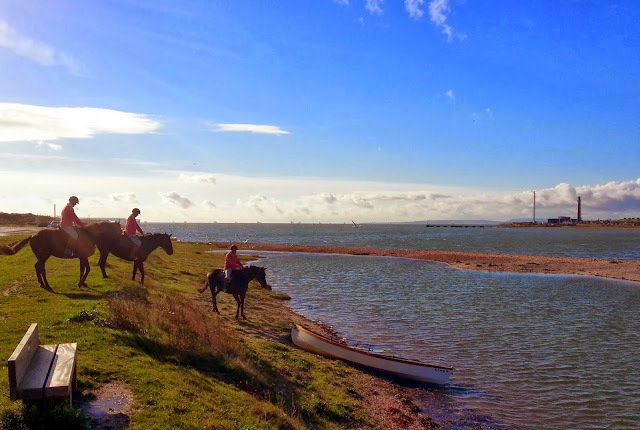 As I was returning to the boat, a rider took his horse to water for a paddle in the sheltered water behind a sand spit, a clear photo opportunity.When I got home, I was surprised to find this image on my phone. It is a feature called 'auto-awesome' that detects a series of similar shots and combines them into an action shot. Normally I'm not a fan of my phone doing stuff all by itself without my say-so but just this once the results are, while not quite awesome, at least pleasing. On the horizon you can see a queue of ships waiting to take the tide up to Southampton. The trip was a reminder of the need to consider the wind carefully before going out. It was a calm F2 when I left the Mill at 08.30, but the forecast was for windier conditions in the afternoon so I went upwind through Langstone Harbour. When I started out from the cafe it was blowing up considerably and I was blown back. A lady member of the club took her own boat out but went downwind. She couldn't make headway coming back and had to abandon the boat on the foreshore near the coastal path. We will have to go along tomorrow and help her lift it back in.